We were joined by a wide range of organisations working across Manchester City who spoke about the positives and challenges of coordinating volunteers at their organisations with others offering support and advice. One pertinent challenge which many shared was volunteer coordinators are increasingly being asked to cover a greater area and manage more dispersed volunteers. This means that it’s harder to give volunteers the face to face time they want and build a strong volunteer culture, not to mention looking after their own wellbeing when they’re on the move all the time. Natalie Trow from Creative Support pitched a challenge she was facing to the group around supported volunteering. Creative Support is an organisation that promotes the independence, inclusion and wellbeing of people with care and support needs. They currently have a group of volunteers who have outgrown their role as meet and greet volunteers. Natalie is looking to find them new roles in organisations who can give them a little support to find their feet. 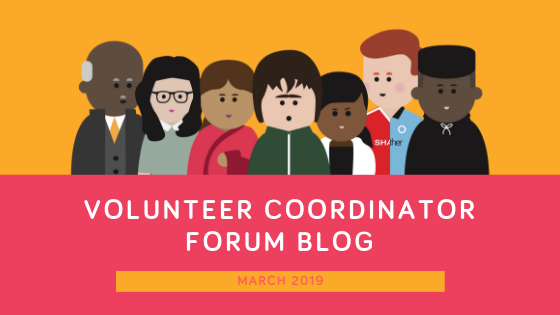 After struggling to find supported volunteering roles to move the volunteers onto Natalie spoke to the group and made some connections that will hopefully lead to new opportunities for her current volunteer. If anyone is interested in hosting a supported volunteer role, please contact Natalie. Following on I gave a brief update from Macc mainly highlighting that our Spirit of Manchester Awards are open for nominations and with four categories specifically focusing on volunteering it’s an opportunity not to be missed, especially with nominations closing at the end of April. I also spoke about the Skill Givers project that has recently launched here at Macc. Working across Manchester and Salford Skill Givers links voluntary sector organisations who help the community get active with skilled employee volunteers from local business. This is great way to get some support to tackle that wish list of tasks you’d love to do if only you had the time and skills at your disposal. If you think you could benefit from this project please get in touch with the project coordinator Hayley Lightfoot. Every year it seems to creep up as everyone is busy running their volunteer programmes and delivering amazing service. So this year we want to help organisations find time and space in their busy schedules to plan a volunteers’ week celebration, whether that’s an event, a project or social media campaign. We have a series of workshops available to organisations in Manchester as well as are annual certificate scheme. To take advantage of our certificate scheme then all you need to do is fill in our online form and we do the rest. Your printed certificates will be with you in the week before Volunteers’ Week, the deadline is 14th May 2019. Heritage Futures Partnership with Manchester Museum – Inc. grants of up to £1000. Manchester Museum is looking to support new programmes, projects or events that respond to its new Heritage Futures exhibition and are inviting community groups, creative practitioners and researchers to put forward their ideas. The Ticket Bank: for charities and community organisations that want to improve access to the arts for their service users; or as a reward for their service users/beneficiaries. Keen to work with anyone that supports individuals facing barriers to attending events and who are less likely to have engaged in arts and cultural activities. Inspire at HOME: £1 tickets available to people who wouldn't ordinarily be able to visit. It is available to charities, voluntary organisations and community groups within the Greater Manchester region. Free space at the The Old Bank, NOMA - A bookable event space that is free to anybody that is working to make Manchester an even more interesting place to be. A big thank you to Claire at GMFR for hosting the VCF at the Greater Manchester Fire and Rescue training centre and we look forward to joining Bella at the Booth Centre in May. Our Volunteer Coordinator Froums are open for any volunteer organisations working in Manchester City so make sure you register ASAP.